There are some basic recipes that my kitchen can simply not do without! Mint coriander chutney is one of them. I find it so handy so always have some in my refrigerator. I usually make a container full every 2 weeks or so. They go in my sandwiches, as a side to samosas and other snack items, in some stuffed parathas and even raitas. This is a very simple recipe but with a lot of versatility in its uses. I make it extremely spicy, you could reduce the chillies to bring down the heat. 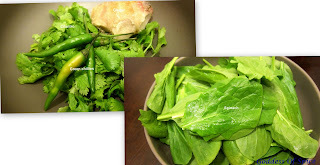 Clean the mint and cilantro leaves, discard the stems. Put everything in a blender and grind it to a smooth paste. That's it! 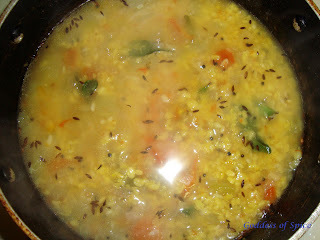 Yesterday's brunch was a mix between puli pongal and aval upma. 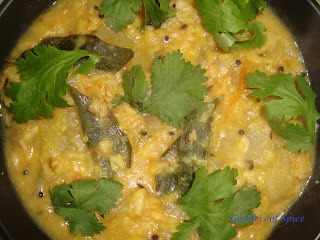 I wanted to make puli pongal, but was too lazy to get the pressure cooker out - I know, crazy right? I don't mind cutting the veggies and doing tons of other stuff, but for some bizarre reason, taking out the pressure cooker just feels like too much effort at times! So instead of using rice and dal, ended up using poha. And of course I had to include a few veggies. Hence the puli aval upma! 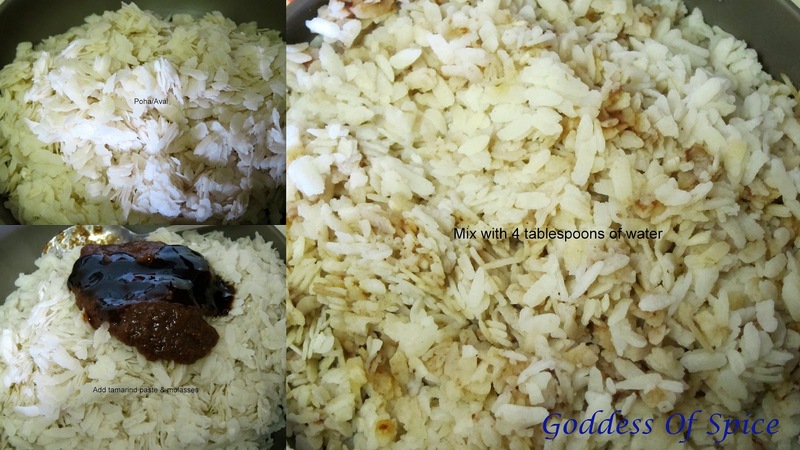 Wash the poha and mix in the tamarind paste and molasses with 4 tablespoons water and set it aside. In a non stick pan, roast the peanuts and remove the skin from them. 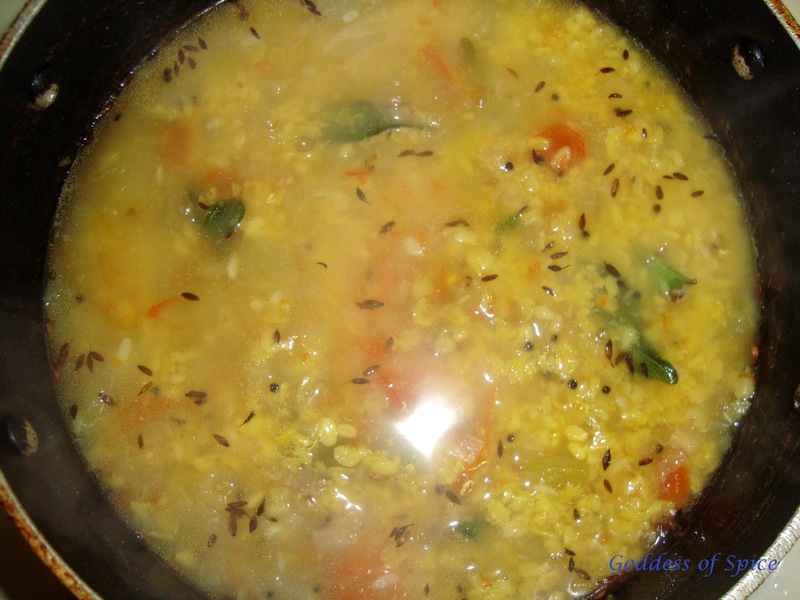 Heat the oil and mustard seeds, cumin seeds, black gram dal, bengal gram dal, red chillies and asafoetida. 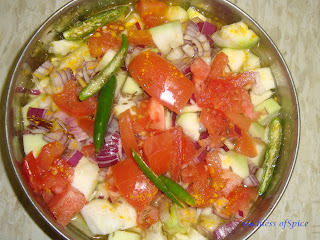 Once the seeds splutter, add the onion, capsicum, curry leaves, green chillies and ginger. Saute till the onions turn translucent. Now add the tomatoes and potatoes and give it a good stir. Add the turmeric, salt and grated carrots. Pour in about ¼ cup water and cook this, covered, for about 10 minutes, until the vegetables are fully cooked. At this stage add the poha mixture and the peanuts and stir until well blended. If the poha feels too dry, you might want to add a few tablespoons of water. Garnish with chopped cilantro and serve. All it needs is a dollop of yogurt and some pickle. Handy Tip: You could use a wee bit of jaggery instead of the molasses or you could completely omit it. I just feel like the addition of a hint of sweetness takes any dish with tamarind in it to a totally different level! My family is really fond of Chinese cuisine. 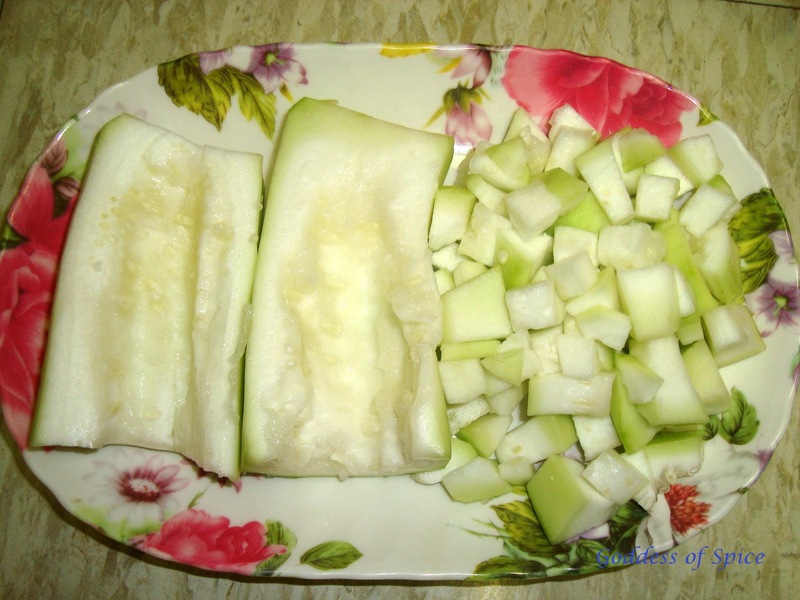 We also love spice in our food, so Schezuan dishes are real popular with us. And my son belongs to the rare species of kids who love broccoli – mind you, not just like, LOVE broccoli! So, today I decided to make broccoli in schezuan sauce. Fortunately, DH & DS are extremely sportive about being guinea pigs to my kitchen lab experiments! So, I do try out a lot of different dishes, making my own modifications to recipes. Sometimes they are a hit, sometimes a miss! Tonight’s was in the former category, thereby making it to the blog! I used readymade schezuan paste this time (Ching’s brand to be specific), but if anyone has their own recipe for the same, go ahead and use it. 1. Toast the sesame seeds in a nonstick pan till they turn a light brown shade. Set them aside. 2. Heat the sesame oil and sauté the chopped onions along with the minced ginger and garlic (I grate them with a microplane grater), till the onion begins to brown. 3. Add the broccoli florets and mix it well. 4. Add the schezuan paste, soy sauce and sriracha sauce. 5. Now drizzle some honey over this and add salt to taste. The salt added should be less than what you would normally add, since we have already added soy sauce. Now add the vegetable stock and cook for a couple of minutes. 6. Empty this into a serving bowl and top it with the toasted sesame seeds. Schezuan broccoli is ready. Tastes really good with rice (I used basmati rice). The heat from the schezuan paste and sriracha sauce provided a nice contrast to the saltiness of the soy sauce and the subtle sweetness of honey. The crunchy sesame seeds sealed the deal! 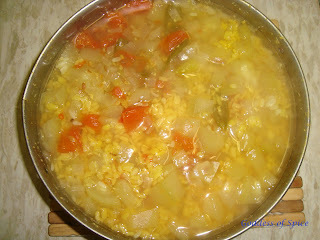 There are some days when you just don’t want to go the daily roti - sabzi - dal route. I love rice (that’s kind of obvious I guess, what with being a Tam-Bram & all)! And some days I have a hankering to eat a simple rice based meal. On one such day, I decided to make kadhi chawal. Kadhi is a yogurt and chickpea flour based gravy dish. There are different kinds of Kadhi’s – you have the Punjabi kadhi (ooh for some kadhi pakoris), the Gujarati kadhi (served with the quintessential khichdi) and the Sindhi kadhi (this one is a more elaborate mixed vegetable based one). You can think of it as a cousin of the South Indian Mor Khuzambu! The simplest of kadhi’s I have ever eaten was one my mom used to make when in hurry – but that one is for another day and another post. Today I am going to write about my Paalak/Spinach Kadhi. 1. In a pan, heat the oil. Add the cumin seeds, carom seeds, curry leaves, red chillies and asafetida. 2. 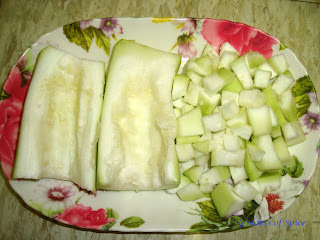 Once the seeds splutter, add the chopped onions and sauté them till the turn translucent. 3. Now add the green chilli paste along with the chopped spinach and cilantro. 4. Make a smooth mix of yogurt, water, sour cream, chickpea flour, and turmeric. Pour this into the pan. 5. Keep the flame low and let this simmer until it begins to boil and thicken, stirring off and on. Now take it off the flame. Kadhi is ready to be served. It is best served hot with rice. Handy Tip: Keeping the gas on a low flame and stirring prevents the yogurt from curdling. I added sour cream because I did not have any sour yogurt on hand. You may replace the yogurt & sour cream with just plain yogurt that has turned sour or even with butter milk.